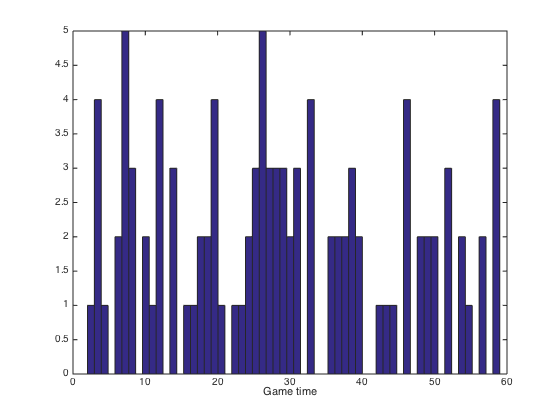 This is the frequency of scoring by time of the game for the University of North Dakota men’s hockey team in 2013-14 regular season games, both home and away. Why? Well, because I can. Secondly it is actually somewhat interesting to see the peaks and valleys. I am adding other data together to gather more insights (hockey analytics is actually interesting (JT translation: difficult) because of the flow of the game). Statistics really has almost limitless applications. I didn’t say you didn’t understand.